Do you think have a slab leak in your Pine Valley house or business? A common plumbing problem is when there is a leak under the floor... you may even find a hot or warm spot in the floor. Plumbers refer to this as a slab leak because it usually occurs under a slab of concrete, whether it's a sidewalk, patio, or a leak under the foundation. Have you noticed an increase in you water, gas or electric bill? Or do you hear water running when all the fixtures in the home are in the off position? You may have a hidden leak. That is why we offer our state of the art Electronic Leak Detection service. 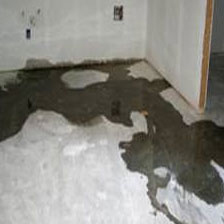 Option One is your local Pine Valley slab leak experts with decades of experience. We can find your slab leak fast, and recommend the best way to repair it at the most affordable price... you have our guarantee. What Causes Pine Valley Slab Leaks Under The Foundation? Settling of the foundation can easily bend and damage pipes beneath the surface causing slab leaks in Pine Valley. Poor workmanship at the time of construction can also be responsible for leaks under the foundation. Slab leaks can also occur from corrosion of the pipe due to high pH levels in the water. Old galvanized pipes will also finally give up and break down after years of service. Our leak detection technology enables us to electronically detect and pinpoint underground sewer line leaks, slab leaks, gas leaks, water leaks and leaks behind walls. Our electric leak detection test takes us right to the source of the leak. This is good news for you! This Means we can detect a leak without being invasive or destructive to your home, making our job easier, more efficient, and more affordable for you. Can Option One Fix Leaks Under A Slab or Floor? After locating the leak, the next step is to determine if it is feasible to do a slab leak repair, which requires removing a section of the concrete floor and digging down to the pipe and performing a copper pipe repair or polybutylene pipe repair (poly pipe repair) which is more generally referred to as a water line leak repair. 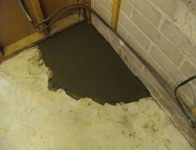 After the repair is complete, we will patch the concrete. This type of repair is not always the best solution since one failure can be a sign of more to come. In that case, a slab leak repipe or re-route would be more cost affective by capping off the failed line and a new line would be installed in the walls or ceiling. Slab leaks can be repaired in a number of ways. Replacing just the one line may be a mistake if there are indications of multiple water pipe failures or "pin holing" in the home pipes or the age of the home. If the home has deteriorating water lines, then a complete copper pipe replacement (copper repipe) would be advisable. All the water lines would be replaced with copper or cross linked polyethylene (PEX), a material which has a proven long term record of being resistant to aggressive water conditions. Option One Plumbing technicians are experts in repairing slab leaks under the foundation in Pine Valley. You can count on us to quickly find the leak, make repairs as necessary with full disclosure of price, and never at an unnecessary cost to you. You want a fast, affordable and honest plumber in Pine Valley, that is Option One.